Whether it be a wedding, engagement, baby, birthday party, or new house...Pinterest is the place to gather and collect ideas. For our new home venture, it's no different. 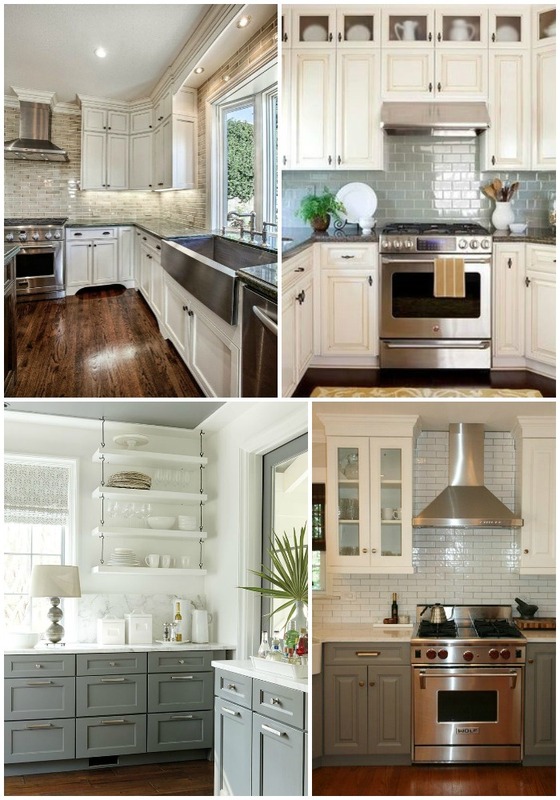 I've started a few Pinterest boards collecting ideas for decor styles and remodeling. Now, our house is considered move-in ready. However, there are some things that we will probably want to update/upgrade in the next 5 years or so. Starting off is our bedroom. The walls are already painted a nice tan/taupe color so we will start with that. 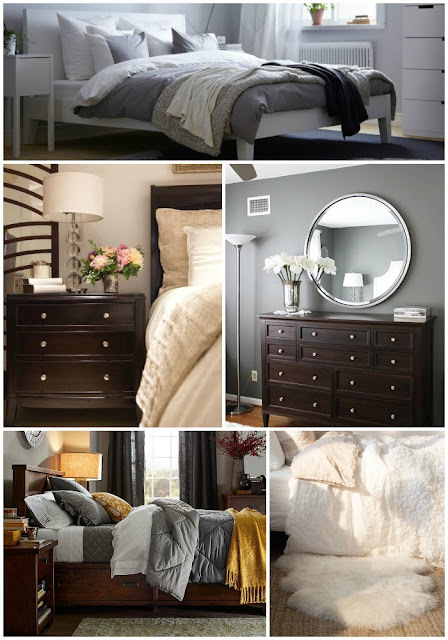 We have dark furniture that looks similar to some in the pins below and I'm all about some neutral grays/tans/white bedding and white/clear accessories. Since the walls and furniture are so dark, I want to brighten it up with whites and grays everywhere else. Hopefully, this will give it that grown up, spa/hotel feel and not look like Pinterest threw up everywhere. The very top pic is our actual duvet cover and I have a white throw over it. Gray/white/neutral throw pillows too! I love the faux sheepskin rugs on the sides of the bed! I smell a DIY project coming soon! Next is the kitchen. We will eventually want to either paint our cabinets white/gray or stain them dark. I'm not a fan of the medium shade of wood they are now. I also would like to consider doing some open cabinetry or glass front for some of our white serveware. I also want to add a tile back splash and update the countertops. This is all eventually down the road. For now, it's fine. Turning a shower curtain into wall art. We have a huge wall in the living room that would be perfect for a large statement piece. Floating "sofa table" shelf for behind the couch. I do fully realize the undertaking of some of these projects...especially the kitchen. Some will take a few hours and others a few weeks...but I'll just remind myself that the place IS MINE and that I have no landlords to answer to. MUAHAHAHAHA. PS: Today is closing! Fingers crossed that everything goes smoothly! that sofa table is a great idea. And i'd love to see what a shower curtain as a wall hanging looks like once you have it up.